FIIs were net sellers of equity on Mon. (Feb 4) but net buyers on the other four trading days. Their total net buying was worth Rs 22.6 Billion. DIIs were net buyers of equity on Tue., Wed. and Thu. (Feb 5, 6 and 7) but net sellers on Mon. and Fri. Their total net selling was worth Rs 116 Million, as per provisional figures. Sluggish returns, market volatility and political uncertainty are affecting inflows into equity mutual funds in India. Inflows in Jan ’19 dropped to Rs 61.6 Billion from Rs 66.1 Billion in Dec ’18 and Rs 84.1 Billion in Nov ’18. As many as 363 infrastructure projects, each worth Rs 1.5 Billion or more, have incurred cost over-runs of over Rs 3.42 Trillion due to delays in land acquisitions, forest clearance and supply of equipment. Strong buying by FIIs and DIIs caused the index to breakout and close above the Fibonacci resistance zone between 36140 and 36810 on Wed. Feb 6. Though it closed above 36810 for a second day, the index formed a small ‘reversal day’ bar (higher high, lower close). Bears decided enough was enough. Profit booking pulled the index back inside the Fibonacci resistance zone on Fri. Feb 8. Bulls failed to regain control of the chart, as the upward breakout above 36810 turned out to be a false breakout. Despite the sharp correction of more than 400 points on Fri., the index eked out a 0.2% gain on a weekly closing basis, and closed above its three daily EMAs in bull territory. Daily technical indicators are turning bearish. 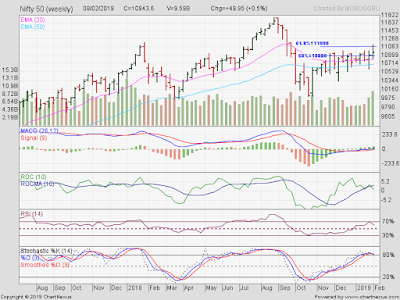 MACD is falling towards its signal line in bullish zone. ROC is falling towards its 10 day MA in bullish zone. 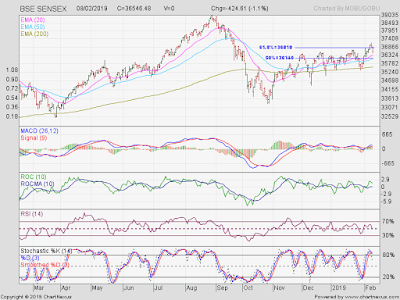 RSI is seeking support from its 50% level. Slow stochastic is about to drop from its overbought zone. Some more correction seems likely. The index had rallied on rumours of an interest rate cut by the RBI at its monetary policy meeting on Thu. 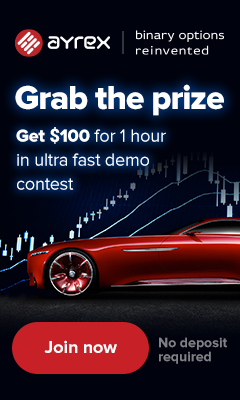 Feb 7. The actual rate cut triggered a sell-off, as there was little follow-up buying due to weak corporate Q3 earnings. FIIs have been net buyers this month. If they continue buying, bullish sentiment may revive. Combined buying by FIIs and DIIs caused the weekly bar chart pattern of Nifty to breakout above the Fibonacci resistance zone intra-week. Absence of follow-up buying and profit booking pulled Nifty back inside the resistance zone by Fri. Feb 8. The index breached the 11000 level after 4 months but failed to sustain above that psychological level. It closed above its two weekly EMAs in bull territory, with a 0.4% weekly gain. Weekly technical indicators are turning bearish. MACD is moving above its signal line in neutral zone. ROC has crossed below its rising 10 week MA and dropped to neutral zone. RSI has turned down after facing resistance from the edge of its overbought zone. Slow stochastic is poised to fall from its overbought zone. Nifty’s TTM P/E has moved up to 27.10, which is well above its long-term average in overbought zone. The breadth indicator NSE TRIN (not shown) is falling inside oversold zone. Some consolidation or correction is likely. Bottomline? For more than 3 months, Sensex and Nifty charts have been retracing the sharp corrections during Sep-Oct ’18. Both indices are trading above their long-term moving averages in bull territories, but are continuing to face resistances from the zone between Fibonacci 50% and 61.8% retracement levels. Repeated failures of upward breakouts may be tipping the balance towards bears.